Listing 12.2. Using a derived object. Listing 12.3. Constructors and destructors called. Listing 12.4. Overloading constructors in derived classes. Listing 12.7. Calling base method from overridden method. Listing 12.8. Using virtual methods. Listing 12.9. Multiple virtual functions called in turn. Listing 12.10. Data slicing when passing by value. Listing 12.11. Virtual copy constructor. How to derive one class from another. What protected access is and how to use it. What is a dog? When you look at your pet, what do you see? A biologist sees a network of interacting organs, a physicist sees atoms and forces at work, and a taxonomist sees a representative of the species canine domesticus. It is that last assessment that interests us at the moment. A dog is a kind of canine, a canine is a kind of mammal, and so forth. Taxonomists divide the world of living things into Kingdom, Phylum, Class, Order, Family, Genus, and Species. This hierarchy establishes an is-a relationship. A dog is a kind of canine. We see this relationship everywhere: A Toyota is a kind of car, which is a kind of vehicle. A sundae is a kind of dessert, which is a kind of food. What do we mean when we say something is a kind of something else? We mean that it is a specialization of that thing. That is, a car is a special kind of vehicle. The concept dog inherits, that is, it automatically gets, all the features of a mammal. Because it is a mammal, we know that it moves and that it breathes air--all mammals move and breathe air by definition. The concept of a dog adds the idea of barking, wagging its tail, and so forth to that definition. We can further divide dogs into hunting dogs and terriers, and we can divide terriers into Yorkshire Terriers, Dandie Dinmont Terriers, and so forth. A Yorkshire Terrier is a kind of terrier, therefore it is a kind of dog, therefore a kind of mammal, therefore a kind of animal, and therefore a kind of living thing. This hierarchy is represented in Figure 12.1. C++ attempts to represent these relationships by enabling you to define classes that derive from one another. Derivation is a way of expressing the is-a relationship. You derive a new class, Dog, from the class Mammal. You don't have to state explicitly that dogs move, because they inherit that from Mammal. New Term: A class which adds new functionality to an existing class is said to derive from that original class. The original class is said to be the new class's base class. If the Dog class derives from the Mammal class, then Mammal is a base class of Dog. Derived classes are supersets of their base classes. Just as dog adds certain features to the idea of mammal, the Dog class will add certain methods or data to the Mammal class. Typically, a base class will have more than one derived class. Just as dogs, cats, and horses are all types of mammals, their classes would all derive from the Mammal class. To facilitate the discussion of derivation and inheritance, this chapter will focus on the relationships among a number of classes representing animals. You can imagine that you have been asked to design a children's game--a simulation of a farm. In time you will develop a whole set of farm animals, including horses, cows, dogs, cats, sheep, and so forth. You will create methods for these classes so that they can act in the ways the child might expect, but for now you'll stub-out each method with a simple print statement. Stubbing-out a function means you'll write only enough to show that the function was called, leaving the details for later when you have more time. Please feel free to extend the minimal code provided in this chapter to enable the animals to act more realistically. When you declare a class, you can indicate what class it derives from by writing a colon after the class name, the type of derivation (public or otherwise), and the class from which it derives. The following is an example. The type of derivation will be discussed later in this chapter. For now, always use public. The class from which you derive must have been declared earlier, or you will get a compiler error. Listing 12.1 illustrates how to declare a Dog class that is derived from a Mammal class. This program has no output because it is only a set of class declarations without their implementations. Nonetheless, there is much to see here. Analysis: On lines 6-27, the Mammal class is declared. Note that in this example, Mammal does not derive from any other class. In the real world, mammals do derive--that is, mammals are kinds of animals. In a C++ program, you can represent only a fraction of the information you have about any given object. Reality is far too complex to capture all of it, so every C++ hierarchy is an arbitrary representation of the data available. The trick of good design is to represent the areas that you care about in a way that maps back to reality in a reasonably faithful manner. The hierarchy has to begin somewhere; this program begins with Mammal. Because of this decision, some member variables that might properly belong in a higher base class are now represented here. For example, certainly all animals have an age and weight, so if Mammal is derived from Animal, we might expect to inherit those attributes. As it is, the attributes appear in the Mammal class. To keep the program reasonably simple and manageable, only six methods have been put in the Mammal class--four accessor methods, Speak(), and Sleep(). The Dog class inherits from Mammal, as indicated on line 29. Every Dog object will have three member variables: itsAge, itsWeight, and itsBreed. Note that the class declaration for Dog does not include the member variables itsAge and itsWeight. Dog objects inherit these variables from the Mammal class, along with all of Mammal's methods except the copy operator and the constructors and destructor. You may have noticed that a new access keyword, protected, has been introduced on lines 24 and 45 of Listing 12.1. Previously, class data had been declared private. However, private members are not available to derived classes. You could make itsAge and itsWeight public, but that is not desirable. You don't want other classes accessing these data members directly. What you want is a designation that says, "Make these visible to this class and to classes that derive from this class." That designation is protected. Protected data members and functions are fully visible to derived classes, but are otherwise private. There are, in total, three access specifiers: public, protected, and private. If a function has an object of your class, it can access all the public member data and functions. The member functions, in turn, can access all private data members and functions of their own class, and all protected data members and functions of any class from which they derive. Thus, the function Dog::WagTail() can access the private data itsBreed and can access the protected data in the Mammal class. Even if other classes are layered between Mammal and Dog (for example, DomesticAnimals), the Dog class will still be able to access the protected members of Mammal, assuming that these other classes all use public inheritance. Private inheritance is discussed on Day 15, "Advanced Inheritance." Listing 12.2 demonstrates how to create objects of type Dog and access the data and functions of that type. Analysis: On lines 6-27, the Mammal class is declared (all of its functions are inline to save space here). On lines 29-47, the Dog class is declared as a derived class of Mammal. Thus, by these declarations, all Dogs have an age, a weight, and a breed. On line 51, a Dog is declared: Fido. Fido inherits all the attributes of a Mammal, as well as all the attributes of a Dog. Thus, Fido knows how to WagTail(), but also knows how to Speak() and Sleep(). Dog objects are Mammal objects. This is the essence of the is-a relationship. When Fido is created, his base constructor is called first, creating a Mammal. Then the Dog constructor is called, completing the construction of the Dog object. Because we gave Fido no parameters, the default constructor was called in each case. Fido doesn't exist until he is completely constructed, which means that both his Mammal part and his Dog part must be constructed. Thus, both constructors must be called. When Fido is destroyed, first the Dog destructor will be called and then the destructor for the Mammal part of Fido. Each destructor is given an opportunity to clean up after its own part of Fido. Remember to clean up after your Dog! Listing 12.3 demonstrates this. 1:     //Listing 12.3 Constructors and destructors called. Analysis: Listing 12.3 is just like Listing 12.2, except that the constructors and destructors now print to the screen when called. Mammal's constructor is called, then Dog's. At that point the Dog fully exists, and its methods can be called. When fido goes out of scope, Dog's destructor is called, followed by a call to Mammal's destructor. It is possible that you'll want to overload the constructor of Mammal to take a specific age, and that you'll want to overload the Dog constructor to take a breed. How do you get the age and weight parameters passed up to the right constructor in Mammal? What if Dogs want to initialize weight but Mammals don't? Base class initialization can be performed during class initialization by writing the base class name, followed by the parameters expected by the base class. Listing 12.4 demonstrates this. NOTE: The output has been numbered here so that each line can be referred to in the analysis. 13: Yorkie is 3 years old. 14: Dobbie weighs 20 pounds. 15: Dog destructor. . . Analysis: In Listing 12.4, Mammal's constructor has been overloaded on line 11 to take an integer, the Mammal's age. The implementation on lines 61-66 initializes itsAge with the value passed into the constructor and initializes itsWeight with the value 5. Dog has overloaded five constructors, on lines 35-39. The first is the default constructor. The second takes the age, which is the same parameter that the Mammal constructor takes. The third constructor takes both the age and the weight, the fourth takes the age and breed, and the fifth takes the age, weight, and breed. Note that on line 74 Dog's default constructor calls Mammal's default constructor. Although it is not strictly necessary to do this, it serves as documentation that you intended to call the base constructor, which takes no parameters. The base constructor would be called in any case, but actually doing so makes your intentions explicit. The implementation for the Dog constructor, which takes an integer, is on lines 80-85. In its initialization phase (lines 81-82), Dog initializes its base class, passing in the parameter, and then it initializes its breed. Another Dog constructor is on lines 87-93. This one takes two parameters. Once again it initializes its base class by calling the appropriate constructor, but this time it also assigns weight to its base class's variable itsWeight. Note that you cannot assign to the base class variable in the initialization phase. Because Mammal does not have a constructor that takes this parameter, you must do this within the body of the Dog's constructor. Walk through the remaining constructors to make sure you are comfortable with how they work. Note what is initialized and what must wait for the body of the constructor. The output has been numbered so that each line can be referred to in this analysis. The first two lines of output represent the instantiation of Fido, using the default constructor. In the output, lines 3 and 4 represent the creation of rover. Lines 5 and 6 represent buster. Note that the Mammal constructor that was called is the constructor that takes one integer, but the Dog constructor is the constructor that takes two integers. After all the objects are created, they are used and then go out of scope. As each object is destroyed, first the Dog destructor and then the Mammal destructor is called, five of each in total. A Dog object has access to all the member functions in class Mammal, as well as to any member functions, such as WagTail(), that the declaration of the Dog class might add. It can also override a base class function. Overriding a function means changing the implementation of a base class function in a derived class. When you make an object of the derived class, the correct function is called. New Term: When a derived class creates a function with the same return type and signature as a member function in the base class, but with a new implementation, it is said to be overriding that method. When you override a function, it must agree in return type and in signature with the function in the base class. The signature is the function prototype other than the return type: that is, the name, the parameter list, and the keyword const if used. New Term: The signature of a function is its name, as well as the number and type of its parameters. The signature does not include the return type. Listing 12.5 illustrates what happens if the Dog class overrides the Speak() method in Mammal. To save room, the accessor functions have been left out of these classes. Listing 12.5. Overriding a base class methodin a derived class. Analysis: On line 34, the Dog class overrides the Speak() method, causing Dog objects to say Woof! when the Speak() method is called. On line 42, a Mammal object, bigAnimal, is created, causing the first line of output when the Mammal constructor is called. On line 43, a Dog object, fido, is created, causing the next two lines of output, where the Mammal constructor and then the Dog constructor are called. On line 44, the Mammal object calls its Speak() method, then on line 45, the Dog object calls its Speak() method. The output reflects that the correct methods were called. Finally, the two objects go out of scope and the destructors are called. These terms are similar, and they do similar things. When you overload a method, you create more than one method with the same name, but with a different signature. When you override a method, you create a method in a derived class with the same name as a method in the base class and the same signature. In the previous listing, the Dog class's Speak() method hides the base class's method. This is just what is wanted, but it can have unexpected results. If Mammal has a method, Move(), which is overloaded, and Dog overrides that method, the Dog method will hide all of the Mammal methods with that name. If Mammal overloads Move() as three methods--one that takes no parameters, one that takes an integer, and one that takes an integer and a direction--and Dog overrides just the Move() method that takes no parameters, it will not be easy to access the other two methods using a Dog object. Listing 12.6 illustrates this problem. 22: // You may receive a warning that you are hiding a function! Analysis: All of the extra methods and data have been removed from these classes. On lines 8 and 9, the Mammal class declares the overloaded Move() methods. On line 18, Dog overrides the version of Move() with no parameters. These are invoked on lines 30-32, and the output reflects this as executed. Line 33, however, is commented out, as it causes a compile-time error. While the Dog class could have called the Move(int) method if it had not overridden the version of Move() without parameters, now that it has done so it must override both if it wishes to use both. This is reminiscent of the rule that if you supply any constructor, the compiler will no longer supply a default constructor. It is a common mistake to hide a base class method when you intend to override it, by forgetting to include the keyword const. const is part of the signature, and leaving it off changes the signature and thus hides the method rather than overriding it. In the next section, virtual methods are described. Overriding a virtual method supports polymorphism--hiding it undermines polymorphism. You'll see more on this very soon. If you have overridden the base method, it is still possible to call it by fully qualifying the name of the method. You do this by writing the base name, followed by two colons and then the method name. For example: Mammal::Move(). This calls the Mammal method explicitly. Listing 12.7 fully illustrates this idea. 1:     //Listing 12.7 Calling base method from overridden method. Output: Mammal move 2 steps. Analysis: On line 35, a Mammal, bigAnimal, is created, and on line 36, a Dog, fido, is created. The method call on line 37 invokes the Move() method of Mammal, which takes an int. The programmer wanted to invoke Move(int) on the Dog object, but had a problem. Dog overrides the Move() method, but does not overload it and does not provide a version that takes an int. This is solved by the explicit call to the base class Move(int) method on line 33. DO extend the functionality of tested classes by deriving. DO change the behavior of certain functions in the derived class by overriding the base class methods. DON'T hide a base class function by changing the function signature. This chapter has emphasized the fact that a Dog object is a Mammal object. So far that has meant only that the Dog object has inherited the attributes (data) and capabilities (methods) of its base class. In C++ the is-a relationship runs deeper than that, however. This creates a new Dog object on the heap and returns a pointer to that object, which it assigns to a pointer to Mammal. This is fine, because a dog is a mammal. NOTE: This is the essence of polymorphism. For example, you could create many different types of windows, including dialog boxes, scrollable windows, and list boxes, and give them each a virtual draw() method. By creating a pointer to a window and assigning dialog boxes and other derived types to that pointer, you can call draw() without regard to the actual run-time type of the object pointed to. The correct draw() function will be called. You can then use this pointer to invoke any method on Mammal. What you would like is for those methods that are overridden in Dog() to call the correct function. Virtual functions let you do that. Listing 12.8 illustrates how this works, and what happens with non-virtual methods. Analysis: On line 11, Mammal is provided a virtual method--speak(). The designer of this class thereby signals that she expects this class eventually to be another class's base type. The derived class will probably want to override this function. On line 30, a pointer to Mammal is created (pDog), but it is assigned the address of a new Dog object. Because a dog is a mammal, this is a legal assignment. The pointer is then used to call the Move() function. Because the compiler knows pDog only to be a Mammal, it looks to the Mammal object to find the Move() method. On line 32, the pointer then calls the Speak() method. Because Speak() is virtual, the Speak() method overridden in Dog is invoked. This is almost magical. As far as the calling function knew, it had a Mammal pointer, but here a method on Dog was called. In fact, if you had an array of pointers to Mammal, each of which pointed to a subclass of Mammal, you could call each in turn and the correct function would be called. Listing 12.9 illustrates this idea. Analysis: This stripped-down program, which provides only the barest functionality to each class, illustrates virtual functions in their purest form. Four classes are declared; Dog, Cat, Horse, and Pig are all derived from Mammal. On line 10, Mammal's Speak() function is declared to be virtual. On lines 18, 25, 32, and 38, the four derived classes override the implementation of Speak(). The user is prompted to pick which objects to create, and the pointers are added to the array on lines 46-64. NOTE: At compile time, it is impossible to know which objects will be created, and thus which Speak() methods will be invoked. The pointer ptr is bound to its object at runtime. This is called dynamic binding, or run-time binding, as opposed to static binding, or compile-time binding. When a derived object, such as a Dog object, is created, first the constructor for the base class is called and then the constructor for the derived class is called. Figure 12.2 shows what the Dog object looks like after it is created. 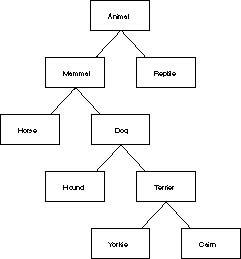 Note that the Mammal part of the object is contiguous in memory with the Dog part. Figure 12.2. The Dog object after it is created. When a virtual function is created in an object, the object must keep track of that function. Many compilers build a virtual function table, called a v-table. One of these is kept for each type, and each object of that type keeps a virtual table pointer (called a vptr or v-pointer), which points to that table. While implementations vary, all compilers must accomplish the same thing, so you won't be too wrong with this description. Figure 12.3. The v-table of a Mammal. Each object's vptr points to the v-table which, in turn, has a pointer to each of the virtual functions. (Note, pointers to functions will be discussed in depth on Day 14, "Special Classes and Functions.") When the Mammal part of the Dog is created, the vptr is initialized to point to the correct part of the v-table, as shown in Figure 12.3. Figure 12.4. The v-table of a Dog. When the Dog constructor is called, and the Dog part of this object is added, the vptr is adjusted to point to the virtual function overrides (if any) in the Dog object (see Figure 12.4) . When a pointer to a Mammal is used, the vptr continues to point to the correct function, depending on the "real" type of the object. Thus, when Speak() is invoked, the correct function is invoked. If the Dog object had a method, WagTail(), which is not in the Mammal, you could not use the pointer to Mammal to access that method (unless you cast it to be a pointer to Dog). Because WagTail() is not a virtual function, and because it is not in a Mammal object, you can't get there without either a Dog object or a Dog pointer. Although you can transform the Mammal pointer into a Dog pointer, there are usually far better and safer ways to call the WagTail() method. C++ frowns on explicit casts because they are error-prone. This subject will be addressed in depth when multiple inheritance is covered tomorrow, and again when templates are covered on Day 20, "Exceptions and Error Handling." Note that the virtual function magic operates only on pointers and references. Passing an object by value will not enable the virtual functions to be invoked. Listing 12.10 illustrates this problem. Analysis: On lines 6-26, stripped-down versions of the Mammal, Dog, and Cat classes are declared. Three functions are declared--PtrFunction(), RefFunction(), and ValueFunction(). They take a pointer to a Mammal, a Mammal reference, and a Mammal object, respectively. All three functions then do the same thing--they call the Speak() method. The user is prompted to choose a Dog or Cat, and based on the choice he makes, a pointer to the correct type is created on lines 44-49. In the first line of the output, the user chooses Dog. The Dog object is created on the free store on line 44. The Dog is then passed as a pointer, as a reference, and by value to the three functions. The pointer and references all invoke the virtual functions, and the Dog->Speak() member function is invoked. This is shown on the first two lines of output after the user's choice. The dereferenced pointer, however, is passed by value. The function expects a Mammal object, and so the compiler slices down the Dog object to just the Mammal part. At that point, the Mammal Speak() method is called, as reflected in the third line of output after the user's choice. This experiment is then repeated for the Cat object, with similar results. It is legal and common to pass a pointer to a derived object when a pointer to a base object is expected. What happens when that pointer to a derived subject is deleted? If the destructor is virtual, as it should be, the right thing happens--the derived class's destructor is called. Because the derived class's destructor will automatically invoke the base class's destructor, the entire object will be properly destroyed. The rule of thumb is this: If any of the functions in your class are virtual, the destructor should be as well. As previously stated, no constructor can be virtual. Nonetheless, there are times when your program desperately needs to be able to pass in a pointer to a base object and have a copy of the correct derived object that is created. A common solution to this problem is to create a Clone() method in the base class and to make that be virtual. The Clone() method creates a new object copy of the current class, and returns that object. Because each derived class overrides the Clone() method, a copy of the derived class is created. Listing 12.11 illustrates how this is used. Analysis: Listing 12.11 is very similar to the previous two listings, except that a new virtual method has been added to the Mammal class: Clone(). This method returns a pointer to a new Mammal object by calling the copy constructor, passing in itself (*this) as a const reference. Dog and Cat both override the Clone() method, initializing their data and passing in copies of themselves to their own copy constructors. Because Clone() is virtual, this will effectively create a virtual copy constructor, as shown on line 81. The user is prompted to choose dogs, cats, or mammals, and these are created on lines 62-74. A pointer to each choice is stored in an array on line 75. As the program iterates over the array, each object has its Speak() and its Clone() methods called, in turn, on lines 80 and 81. The result of the Clone() call is a pointer to a copy of the object, which is then stored in a second array on line 81. On line 1 of the output, the user is prompted and responds with 1, choosing to create a dog. The Mammal and Dog constructors are invoked. This is repeated for Cat and for Mammal on lines 4-8 of the constructor. Line 9 of the constructor represents the call to Speak() on the first object, the Dog. The virtual Speak() method is called, and the correct version of Speak() is invoked. The Clone() function is then called, and as this is also virtual, Dog's Clone() method is invoked, causing the Mammal constructor and the Dog copy constructor to be called. The same is repeated for Cat on lines 12-14, and then for Mammal on lines 15 and 16. Finally, the new array is iterated, and each of the new objects has Speak() invoked. Because objects with virtual methods must maintain a v-table, there is some overhead in having virtual methods. If you have a very small class from which you do not expect to derive other classes, there may be no reason to have any virtual methods at all. Once you declare any methods virtual, you've paid most of the price of the v-table (although each entry does add a small memory overhead). At that point, you'll want the destructor to be virtual, and the assumption will be that all other methods probably will be virtual as well. Take a long hard look at any non-virtual methods, and be certain you understand why they are not virtual. DO use virtual methods when you expect to derive from a class. DO use a virtual destructor if any methods are virtual. DON'T mark the constructor as virtual. Today you learned how derived classes inherit from base classes. This chapter discussed public inheritance and virtual functions. Classes inherit all the public and protected data and functions from their base classes. Protected access is public to derived classes and private to all other objects. Even derived classes cannot access private data or functions in their base classes. Constructors can be initialized before the body of the constructor. It is at this time that base constructors are invoked and parameters can be passed to the base class. Functions in the base class can be overridden in the derived class. If the base class functions are virtual, and if the object is accessed by pointer or reference, the derived class's functions will be invoked, based on the run-time type of the object pointed to. Methods in the base class can be invoked by explicitly naming the function with the prefix of the base class name and two colons. For example, if Dog inherits from Mammal, Mammal's walk() method can be called with Mammal::walk(). In classes with virtual methods, the destructor should almost always be made virtual. A virtual destructor ensures that the derived part of the object will be freed when delete is called on the pointer. Constructors cannot be virtual. Virtual copy constructors can be effectively created by making a virtual member function that calls the copy constructor. Q. Are inherited members and functions passed along to subsequent generations? If Dog derives from Mammal, and Mammal derives from Animal, does Dog inherit Animal's functions and data? A. Yes. As derivation continues, derived classes inherit the sum of all the functions and data in all their base classes. Q. If, in the example above, Mammal overrides a function in Animal, which does Dog get, the original or the overridden function? A. If Dog inherits from Mammal, it gets the function in the state Mammal has it: the overridden function. Q. Can a derived class make a public base function private? A. Yes, and it remains private for all subsequent derivation. Q. Why not make all class functions virtual? A. There is overhead with the first virtual function in the creation of a v-table. After that, the overhead is trivial. Many C++ programmers feel that if one function is virtual, all others should be. Other programmers disagree, feeling that there should always be a reason for what you do. Q. If a function (SomeFunc()) is virtual in a base class and is also overloaded, so as to take either an integer or two integers, and the derived class overrides the form taking one integer, what is called when a pointer to a derived object calls the two-integer form? A. The overriding of the one-int form hides the entire base class function, and thus you will get a compile error complaining that that function requires only one int. The Workshop provides quiz questions to help you solidify your understanding of the material that was covered, and exercises to provide you with experience in using what you've learned. Try to answer the quiz and exercise questions before checking the answers in Appendix D, and make sure you understand the answers before continuing to the next chapter. 6. How do you invoke a base member function from a derived class in which you have not overridden that function? 1. Show the declaration of a virtual function that takes an integer parameter and returns void. 3. If, in Exercise 2, Shape takes no parameters, Rectangle takes two (length and width), but Square takes only one (length), show the constructor initialization for Square. 4. Write a virtual copy constructor for the class Square (in Exercise 3).